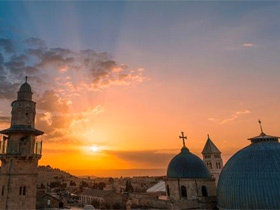 The National Geographic film “Jerusalem” is playing in IMAX and digital 3D cinemas in museums in the US and around the world. KIM LAWTON, correspondent: The National Geographic movie Jerusalem calls the city Jerusalem the most fought over piece of land in history. But the filmmakers say they didn’t want to make a movie about conflict. 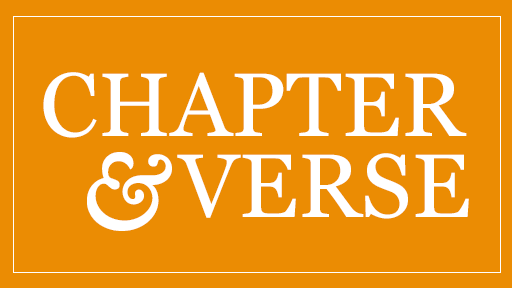 Instead, they wanted to look at what they call the “profound spiritual and historical connections” to Jerusalem among Jews, Christians and Muslims alike. 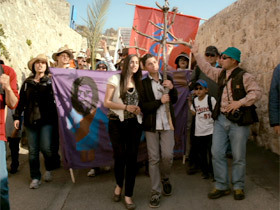 The film tells the story in part through the eyes of three young women from Jerusalem. They recently came to the US together. Revital Zacharie is an Israeli Jew, Farah Ammouri is a Palestinian Muslim and Nadia Tadros is a Palestinian Christian. LAWTON: In the film, the women describe the importance of Jerusalem to their particular faith traditions. TADROS (in film): For me the best time to come to Jerusalem is Easter. Every year, me and my brother, George, join in the Palm Sunday procession and we end up meeting people from all over the world. In the Christian quarter we have the Ethiopians, the Greek Orthodox, the Catholics, the Coptics, the Syrians, each community celebrates Easter in their own way. Next to the Christian quarter we have the Armenian quarter and they celebrate Easter in their own church. REVITAL ZACHARIE (in film): My grandfather came to Jerusalem when he was 12 years old in 1936 because his father felt that something bad is going to happen in Europe. But all the rest of his family stayed in Poland and they all perished during the Holocaust. Since Biblical times we have a special word when Jews return to the promise land. We say we're making aliyah, which means going up to a higher place, and for us the Jews, there is no higher place than Jerusalem. At the end of our holiest days, like Yom Kippur and Passover, we sing "next year in Jerusalem". For hundreds of years this was the Jewish dream to be back in Jerusalem. And I have the chance to live that dream. FARAH AMMOURI (in film): Out of all the buildings in Jerusalem, the most beautiful to me is the Dome of the Rock. The Dome of the Rock is actually built over a rock which we call As-Sakhrah where we believe Prophet Mohammed, peace be upon him, rose to heaven and led all the Prophets in prayer. AMMOURI (in intv): To the Muslim world Jerusalem is a city of the Prophets, it's where many Prophets have been and of course; many Muslims from all over the world come to worship at the Dome of the Rock; and of course, we have a major part in the Old City which is the Muslim Quarter. LAWTON: In the film, the women also describe Jerusalem’s role in their own spiritual identities. Tadros loves to go to the Church of the Holy Sepulchre. TADROS (in film): Sometimes I see people who have dreamed their whole life of coming here. I realize how lucky I am to live in Jerusalem. I can come to the Church anytime I want to touch the Rock of Golgotha. 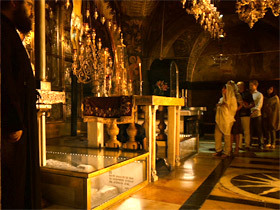 It’s where we believe Jesus died on the cross. ZACHARIE (in film): I can really feel the power of this place, how much energy is in this place. I have this tradition to go every birthday and to put a prayer note in the wall. We believe all prayers pass through the wall on their way to God. AMMOURI (in film): Jerusalem to me is more than a city. Its beauty, its spirit, also my religion–but most importantly, it’s my family. LAWTON: The women may share a love for Jerusalem, but they acknowledge they live there in very separate worlds. TADROS (in intv): If you just stand in the middle of the Old City for a moment and look around you, you see people who are similar to you, and they are not necessarily Christian like me. Every person is different and yet, when foreigners come to Jerusalem, they think that we're the same. They think that we're sisters. But in Jerusalem, we're not. LAWTON: Their recent trip together to help promote the film gave the women a rare opportunity to build relationships with other Jerusalem residents across religious and political lines. AMMOURI (in intv): I was able to communicate more with the girls and know more about their faiths, so I am enriched by their religion and their culture and how similar we are and how connected we are to each other in ways we don’t realize. ZACHARIE (in intv): We had the opportunity to spend time together and to get to know each other deeply and to become kind of friends. LAWTON: They acknowledge such opportunities can be rare inside Jerusalem. TADROS (in intv): Not meeting people who are exactly near you makes you like suspicious and curious at the same time and all of the time you want to know more. LAWTON: Still they hope their generation can help lead the way to change. TADROS (in intv): I hope that one day we can be able to encourage people to break the walls, the invisible walls inside Jerusalem and be able to talk with each other for the first time. LAWTON: And the creators hope their film Jerusalem helps do that. I’m Kim Lawton reporting. A new IMAX 3D film by National Geographic Entertainment explores the beauty and sacredness of the ancient city and its holiest sites. Correspondent Kim Lawton reports on the film and interviews three young women—a Christian, a Jew, and a Muslim—featured in the movie about what the city of Jerusalem means to them.